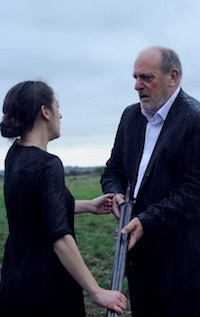 Set on a struggling farm on the – regularly flooded – Somerset Levels, ‘The Levelling’ sees Clover (Kendrick) return to the family farm from her veterinary studies prematurely following the shocking news of her brother’s death. She must now address a fractured relationship with her father (Troughton), who becomes abrasive and uncooperative when she tries to establish the cause of the tragedy. With the flood-damaged setting framing the damaged lives of the main characters, the mystery deepens as Clover probes in a film of intense emotion, conveyed by two outstanding central performances. Dickson Leach’s first feature tackles a challenging subject with such assurance that great things can be expected from her in future. The Review in The Guardian is deep and analytical to the point of plot-spoiling. More uplifting is this piece from Den of Geek which enthuses about Leach’s debut film.